If you are a guitar player and visit any guitar-related websites, you have undoubtedly seen the argument that continues to rage about whether or not you can play metal music on a Fender guitar. It is possible, with the correct amp settings, pickup combination and playing technique to get an acceptable metal tone from a Telecaster or Stratocaster. I don’t think anyone, however, would argue that they are the best option for playing metal. So what are the best metal guitars? In this post, I’ve decided to break the winners out by price range. I figure that most people have some kind of budget in mind when looking for an instrument. That way if someone is looking for something in the $600 - $800 range, they can jump right to that section. Pickups for metal should be high-output “hot” pickups. These can be either passive or active pickups. Active pickups are usually louder and provide for more tonal adjustment, but they can be finicky and more difficult to dial-in. They also do not attenuate as well as passive pickups when going from higher to lower volumes. Learn more about types of pickups and best pickups for metal. Necks should be thin and the action should be low so it’s easier to shred. Three-piece or reinforced necks are more stable than one-piece necks and neck-through designs where the neck passes through the entire length of the guitar, with the side “wings” glued on, produce significantly greater sustain than bolt-on or set in necks since the body and neck are essentially one single piece of wood. The body should be well-balanced with the neck so that it doesn’t sit at a weird angle across your body. This can be a problem with odd-shaped guitars. They should also not be too heavy so that you can stand for long periods of time without the guitar becoming uncomfortable. Among the most commonly used guitar woods, ash, maple and mahogany are the heaviest, while basswood, alder and poplar rank among the lighter woods. A good balance between light and heavy is best for sustain since wood that is too heavy and dense tend to dampen vibrations and wood that is too light don’t have enough density to sustain those vibrations. There is much debate about “tonewoods”, but as a recreational luthier with a number of guitars to my credit, the type of wood used has very little effect on the tone of a guitar since the tone is strictly a function of the electromagnetic signal produced by the interaction of the strings and the pickups and the type and/or density of the wood had no ability to “color” the electromagnetic signal. High quality hardware is important, but one of the advantage that guitarists have is the vast number of aftermarket parts available to upgrade your guitar. It’s very common for guitarists to swap out parts like tuners, nuts, bridges and pickups to upgrade cheap guitars. Guitars of today have far more options than they did years ago. Coil tapping, for example allows a guitarist to turn one of the coils of a humbucking pickup off to produce a sound with more treble and less low end. It can also be use to change the direction of the current flow within an individual coil to add “jangle” or “twang” to the tone. Active pickups offer even more in the way of options since some included options for equalization or stereo output. Instead of focusing strictly on tonal quality and features and of each instrument, any “metalhead” with an eye to performing knows that it never hurts for your axe to look especially “badass”. Weird or edgy shapes can give you that extra something that may be missing in your performance. After all, stage presence is an important aspect of your overall performance. These are what I would term “budget” axes, but that doesn’t necessarily mean they aren’t quality guitars. These are all instruments by major manufacturers that you’ve heard of, but are on the lower end in terms of price. What that usually means, is that they are generally manufactured overseas and some of the parts might be a step down from what they install on their top-of-the-line models but for the beginner – or even intermediate – guitarist, these are great instruments. This model is very popular with metal musicians and is nearly identical to the KV2 made famous by such metal luminaries as Kerry King of Slayer and Dave Mustaine of Megadeth. Excellent metal tone courtesy of the high-output pickups and string through body design. This guitar also receives high praise for its solid craftsmanship and represents a very good value for the money. 2 Jackson humbuckers with ceramic magnets for high-output. Jackson designed pickups are reliable and sound fine, but are not considered top-of-the-line. Features a thin-line graphite reinforced 24-fret maple neck with 25 ½” scale. The graphite reinforcement is a huge plus, especially for gigging musicians who are hard on their equipment. Lightweight basswood body with a string through body that increases sustain. As with a lot of more budget model guitars, the hardware such as bridge, tuners, etc. are acceptable, but would benefit from upgrading. Basic controls with 1 tone and 1 volume control, along with a 3-way selector switch. Would have given a higher rating for more features such as coil splitting and series/parallel switching options. Hard to go wrong with the classic “flying V” profile. This guitar just screams heavy metal. Go onstage with this beast and people know you’re there to rock! The F-50 features a basswood body, bolt-on maple neck and rosewood fingerboard with 24 extra jumbo frets. The thin-U neck profile is perfect for fast metal solo runs. The F-50’s LH-150 high output passive pickups offer outstanding tonal range and punch while the TOM bridge is the same one used on the other top-of-the-line LTD guitars used by metal guitar heroes like James Hetfield’s Iron Cross and Alan Ashby’s AA-600. It’s wild design and beautiful translucent finish makes it as attractive as it is affordable. 2 EMG passive LH-150 pickups. These high-output passive pickups are not quite as versatile as active pickups, but they are great for metal. The ceramic magnets make for clear, biting highs and well-defined lows with limited mid-range, just what you look for in a metal pickup. 1-piece maple bolt-on 24.75 inch scale neck with 24 fret rosewood fingerboard and thin neck profile for fast playing. Lightweight basswood body with carved top, this guitar is well balanced and comfortable to hold for long periods of time. 2 volume and 1 tone control with 3-way toggle. Heavily modified Strat style body. The carved and body, high gloss finish and distinctive angular design definitely stand out on stage. For traditional metalheads, it’s hard to beat the Epiphone Les Paul 100 (for the uninitiated, Gibson and Epiphone models are manufactured by the same company). It has the classic Les Paul styling (it’s cut to the same specs as Les' 1952 original) at a price that almost anyone can afford. Great classic Les Paul sound. Works equally well for metal, rock, jazz and pop, but the 700T/650R pickup combination makes this instrument a real screamer. Very similar to the Les Pauls used by Zakk Wylde, Randy Rhoads of Ozzy Osbourne fame, and Willie Adler of Lamb of God. 2 Gibson humbucking pickups. 700T (bridge) and 650R (neck). Both the 700T and 650R are hot high-output pickups meant for shredding, with a nice “meaty” saturated sound and distortion that doesn’t sound muddy. They also clean up nicely at lower volumes. Mahogany, thin-profile 22-fret, bolt-on neck. Standard Gibson 24 ¾” scale. Medium action. Les Pauls have always had a 22 fret fingerboard, but for metal it’s nice having 24 frets, a point against this model. Also, the Nitro-cellulose finish on Gibson and Epiphone necks can become sticky or overly slick depending upon where it was finished, something that has traditionally plagued guitars from these manufacturers. Chambered mahogany body, carved maple top. Nickel tune-o-matic bridge/tailpiece. These parts are manufactured to a lower standard than on the pricier Gibson models, so many players will make the relatively low cost upgrade and swap out the stock parts for Gibson OEM hardware. 2 tone and 2 volume controls allow for independent volume and tone adjustment of each pickup. 2-way toggle. Classic single cutaway Les Paul shape. The Les Paul is an icon for the more traditionalist players harkening back to the early days of metal with bands like Iron Maiden and Motörhead. The Ibanez brand has become almost synonymous with heavy metal, and no listing would be completed without at least one Ibanez model making the cut. The GRX20Z is an excellent entry-level metal guitar. The Infinity R pickups are surprisingly good sounding and robust for an instrument at this price point. Reviews for the new FAT6 tremolo have been mixed, with some players noting its excessive level of sensitivity, while others say it stays in tune very well. As this is a new product from Ibanez it may take some time to work out the kinks. Regardless, some fine tuning of the tremolo system and springs will likely solve most problems. 2 Ibanez Infinity R humbucking style pickups. The high-output Infinity Rs have had exceptionally good reviews. Very responsive across the spectrum, delivering earth-shaking low mids and clear, full-bodied highs. 25 ½” scale bolt on maple neck with 22-fret rosewood fingerboard. Fast action. This guitar could benefit from a full 24 fret neck like the more upscale Ibanez models. Lightweight poplar body. Poplar is an unusual wood choice for the body, but this a new model so only time will tell if the somewhat softer wood choice will affect durability in the long-term. Chrome hardware and Ibanez FAT6 tremolo bridge. The FAT6 bridge is a new development from Ibanez and is likely to experience some growing pains. A Floyd Rose or Kahler tremolo might have been a better choice – but also would likely have raised the price point. 1 volume and 1 tone controls allowing for independent tone adjustment of each pickup. 3-way toggle. No coil splitting or series/parallel switching. Ibanez modified Strat profile. The sharper Ibanez horn shape is very popular with guitarists. It just looks great. ​The mid-range price point opens up far greater options for the discerning player. Guitars in this range are usually built with better quality wood, better hardware and electronics, and more options, such as top quality tremolos and greater switching options. Nickel Hardware, 25" Scale Length. Controls : Volume and Push/Pull Tone Control with 3-Way Blade Pickup Switch. The SE Standard 24 is the most affordable instrument in the PRS line, and is very popular with metal guitarists. Its 24 fret, 2-octave range gives artists like Seth Morrison and Corey Kooper of Skillet all the flexibility they need for their hard driving brand of Christian rock. This instrument has excellent tone at all volumes and the 24 fret neck gives it a full two octave range. 2 PRS designed SE pickups. PRS pickups have come a long way over the last few years, matching up quite well against models from Seymour Duncan and DiMarzio, the default standard bearers for metal pickup. May not be there quite yet, but very respectable nonetheless. Features a wide, thin maple neck with a rosewood fingerboard, 24 frets and a 25” scale. Unique PRS bird inlays. Beautiful neck with excellent action and the 24 frets are perfect for those screaming metal solos. Mahogany body, just the right weight and balance. Good sustain. High quality nickel hardware. Would benefit from a locking tremolo system, but the PRS model trem stays in tune amazingly well. Basic controls with 1 tone and 1 volume control, along with a 3-way selector switch. High quality electronics. I would like separate volume control for each pickup. Classic double cutaway design with unique beveled edges on inner edges of the upper horns. Classy, rather than radical, appearance will probably appeal to more traditionally-minded players like myself. There has been a real explosion in the use of 7-string guitars in metal – which, incidentally, Ibanez and Steve Vai paved the way for back in 1989 with the Universe series – and the RG 7421 fits the bill with 24 frets and 7 strings. This instrument has fantastic metal tone, in fact, for lead work, as long as you don’t require a tremolo, it’s virtually impossible to find a better guitar at any price. It’s a real shred machine and at a very reasonable price. 2 high-output Ibanez Quantum pickups with ceramic magnets. These pickups sound fantastic. As good as any other pickups on the market. Maple neck with 24-fret rosewood fingerboard. 25 ½” scale. To me, maple neck has a better feel, softer and more buttery. Mahogany slab body with elbow contour. Nothing of real note about the body, nice balance and weight. Black, high quality hardtail bridge and tuners. 1 tone and 1 volume control and 5-way toggle allowing for all potential configurations including coil tapping on both pickups and series/parallel on the neck pickup. 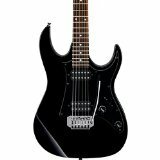 Instantly recognizable classic Ibanez modified Strat style body with pointy horns. Cool looking. Hell yeah! This axe looks badass. B.C. Rich’s innovative designs are a fixture in metal music and the Warlock Mk3 is no exception. Once you step on stage with this bad boy, people know you’re serious. This guitar has great metal tone and the body is very light despite its mahogany construction, which is a big plus when you’re playing long sets without a break. Players also gave kudos to the Floyd Rose double-locking tremolo system. Stays in tune no matter what. Along with B.C. Rich’s reputation for producing top quality guitars, the barbed wire paint job looks extra cool. 2 B.C. Rich designed humbucking pickups. Good, solid metal sound. Lack a bit of brightness, could use a bit more high-end. Bolt-on maple neck, 25 ½” scale length. 24-fret rosewood fingerboard and fast action. Mahogany body that is very light in comparison to other mahogany body guitars owing to the unique body shape. Floyd Rose double locking tremolo system and top quality black tone hardware. 1 tone and 1 volume control with 3-way toggle. Somewhat of a disappointment on what would otherwise be an outstanding guitar, the Mk3 lacks push/pull pots or switching for coil tapping or series/parallel mode. This guitar would be hard to beat if those features were present. Along with its other B.C. Rich stable mates, the Bich, Mockingbird, Eagle and Villian, one of the all-time cool heavy metal looking body shapes. The M100FM features a basswood body with a flamed maple top, bolt-on maple neck and rosewood fingerboard with 24 frets. This guitar also features a thin neck and low, fast action. It also has a pair of LH-150 high output passive pickups. The M100FM comes equipped with a Floyd Rose Special bridge and locking nut. Visually, the M100FM closely resembles Kirk Hammett’s famous KH-2, KH-202 and KH-602 models, the difference being that the M100FM features a transparent finish that nicely shows off the beautiful grain pattern of the flamed maple top. 1-piece 24.75 inch scale maple bolt-on neck with 24 fret rosewood fingerboard, thin neck profile and low, fast action. Lightweight basswood body with carved, contoured maple top makes for a perfectly balanced instrument. Modified Strat style body. The black, high gloss translucent finish and distinctive tiger flamed maple top make for a beautiful guitar. You’ll find some higher end professional model guitars in this range, including the base “T” model Gibson Explorer, Flying V, Les Paul and SG models. These guitars almost always include top-of-the-line hardware and electronics and impressive graphics, as well as carved maple tops. The EC-1000 was the basis for James Hetfield’s Iron Cross signature guitar so it already has plenty of metal cred. Everything about this guitar screams top quality from the solid mahogany body and neck with 24 fret rosewood fingerboard, to the matched EMG active pickups. Even the gold-tone hardware is top shelf with TonePros locking TOM bridge and tailpiece and LTD locking tuners. Visually, the EC-1000 is stunning with abalone inlays, bound neck and body and a high gloss black finish. 2 EMG active pickups. The EMG 81 and EMG 60 pair is the same pair used by Kirk Hammett in his original KH-2 model LTD. These pickups feature excellent high and low frequency response with scooped mids. Mahogany set neck design with 24.75 inch scale and 24 fret rosewood fingerboard, thin neck profile and low, fast action. Solid mahogany body with carved top makes for a well-balanced, if slightly heavy, instrument. The weight can cause some fatigue if worn for long periods of time. Modified Les Paul style body. The black, high gloss finish and gold hardware along with the bound neck and body and abalone inlays make this a really classy looking guitar. Just looking at this guitar leaves no doubt about what it’s meant for, and that is heavy metal rock and roll. This awesome instrument is not just for Avenged Sevenfold fans, it is the perfect tool for any metal guitarist who values super fast neck action, for sweep picking, tapping or fast alternate picking runs, excellent high-frequency response and a smooth tremolo that stays in tune no matter how frequently used. It also looks totally unique with it Synyster Gates pinstripe graphics and “death bat” inlays. Seymour Duncan Invader Syn TB-8 (bridge) and Seymour Duncan Invader (Syn SH-8N) are custom matched for this guitar. These are top-of-the-line pickups designed to give great response across the spectrum, but are especially good at delivering crisp, clear high-frequency tone no matter the volume. Set 3-piece mahogany neck, 24 fret ebony fingerboard with custom delivering inlays and low, fast action. Perfect for soloing. Mahogany body with good balance. Ultra access cutaway allowing easy access to even the highest frets. Grover tuner and Floyd Rose 1000 tremolo system. 1 tone and 1 volume control with 3-way toggle. Push/pull pot for coil tapping, allowing for a wide variety of tones. One of a kind Synyster Gates body style with pinstripe paint job. Makes a real impact. Very cool. The Hellraiser C-1 FR offers Schecter’s best performing guitar for the money. This outstanding entry features a pair of EMG active pickups, giving it the widest tonal range of any of the guitars on this list. From growling lows to screaming highs, this is an outstanding instrument and an excellent tool for the metal musician. With its translucent finish and carved, figured top, it is also an attractive guitar that makes a real statement. 2 EMG active pickups. 81TW (bridge) and 89R (neck). These high-output active pickups are fantastic for metal. Loud and crunchy with superb mid-range response, these pickups are among the best available. 3-piece mahogany set neck with 24 fret rosewood fingerboard and low, fast action. Mahogany body with carved maple top, this guitar is perfectly balanced and comfortable to hold for long periods of time. 2 volume and 1 tone control with 3-way toggle. Push/pull volume and tone controls for coil splitting and series/parallel configuration for a wide variety of tonal variation. Bound Strat style body. The carved and bound body is beautiful, particularly with the rich translucent finish, but it doesn’t have a particularly distinctive shape like some of the other Schecter guitars. This is where you’ll find the high-end and boutique guitars most sought-after by professional musicians. I’ve limited this list to production models only and have not included one-off ghost built guitars, custom shop models or exotics. The RG652AHM has a 5-piece maple/walnut "Super Wizard High Performance" neck with a unique 4 bolt pattern that allows excellent access to the higher frets. The scale length is 25.5” and the 24 fret fingerboard is bound birdseye maple. The body is solid ash making it relatively heavy, similar to mahogany. The bridge is an Ibanez custom designed Edge tremolo system with a locking nut. The high-output DiMarzio Air Norton (neck) and The Tone Zone (bridge) pickups offer a broad dynamic range and great sustain. The trans-blue finish shows off the unusual ash grain pattern. 2 DiMarzio passive pickups. The Air Norton neck pickup produces a tone that is deep and warm, but not muddy. It’s also got cool harmonics, which is unusual for a neck pickup. The Tone Zone bridge pickup has a wider dynamic range than most high-output pickups and pairs well with the Air Norton. 5-piece maple/walnut neck with 25.5 inch scale, jumbo frets and 24 fret birdseye maple fingerboard. Solid ash body with contoured top is on the heavy side and not particularly well balanced, being somewhat bottom heavy. 1 volume and 1 tone control with 5-way selector switch with series/parallel and coil splitting capability. Modified Strat style body. The nebula green burst translucent finish on the top and natural blond finish on the bottom and sides, is super sharp and contemporary looking. Solid mahogany body with premium nitrocellulose finish delivers super-fat tone, the extended neck joint ensures stability and solid and a Tune-O-matic bridge with stop bar tailpiece lock it all down for uncompromising durability. A 495R Hot Ceramic pickup in the neck position and a 500T Super Ceramic in the bridge deliver smoking' tone for your most demanding rock requirements, giving unprecedented power for mammoth crunching rhythm and singing lead tones alike. The Gibson USA's 2016 Traditional range include our original neck width of 1 11/16" at the nut, high-quality manual tuners, traditional Graph Tech nut, and a thicker one-piece rosewood fingerboard with a hand-rubbed oil finish for a plush look and feel. It would be almost sacrilege to include the Explorer without including one of the most iconic metal guitars of all time, the Gibson Flying V. Often copied, but never successfully duplicated, this guitar helped launch the careers of metal gods like Kirk Hammett and Michael Schenker as well as being played by all-time guitar legends like Jimi Hendrix and Albert King. 2 Gibson humbucking pickups. 500T (bridge) and 498R (neck). Like the Explorer, the Flying V is equipped with Gibson’s highest output humbuckers. Mahogany set neck, 22-fret rosewood fingerboard and low, fast action. 24 ¾” scale length. This neck is identical to the one on the Explorer. Bound slab mahogany body. Not as comfortable to wear hanging from a strap, but that is somewhat compensated for by the lower mass. High quality nickel tune-o-matic bridge and stop tailpiece. 1 tone and 2 volume controls with 2-way toggle. Setup is identical to the Explorer. Classic Flying V shape. This is the shape that launched the career of dozens of metal guitarists. Despite the fact that this design has been in production since 1958, it is still one of the coolest guitars around as evidenced by the literally hundreds of “V” shaped guitar knockoffs. With an ever growing roster of heavy metal guitarists, ESP is making a huge mark in the metal world, primarily by virtue of their guitars featuring active electronics. The E-11 FRX looks as good as it sounds, with great mid-range and lower frequency response, due to its high-output active pickups. 2 EMG 89 active humbucking pickups produce excellent metal tone. There is not one bad thing to say about the response and just about any tone can be dialed-in. 3-piece through maple neck, 24-fret ebony fingerboard. 25 ½” scale length. The through neck design helps produce endless sustain. Mahogany body with flame maple top. The usual body shape is pleasingly light and the overall instrument is well balanced. Gold tone hardware. Floyd Rose Original tremolo system and Gotoh locking tuners. 1 tone and 1 volume control with 3-way toggle. Push pull knobs for coil tapping and series/parallel modes. Independent volume controls for each pickup would have earned this guitar a perfect 5. If it was possible to score higher than a 5 on appearance, this would be the guitar to do it with what can only be described as a “wicked” double cut profile. This thing looks dangerous. 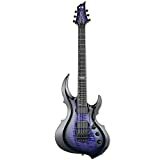 It’s pretty much unanimous that those who have played the Banshee Elite-7 FR with the Sustainiac love it. It takes some getting used to, since without the Sustainiac, the only way to get the same kind of sustain and feedback is to run the guitar and amp at extremely high volumes. Schecter USA Supercharger Mach 7 (bridge) and Sustainiac (neck) pickups. The Mach 7 is high-output pickup featuring a barium impregnated ceramic magnet for super heavy metal tone. This pickup is LOUD. The Sustainiac is a totally new technology you can read more about here (*) for all the cool technical details. Neck-through design. Maple/walnut multi-ply with carbon fiber reinforcement rods with 24-fret ebony fingerboard. 26 ½” scale length. Super fast action with exceptional feel. Swamp-ash body wings with flamed maple top. Nice balance and weight. Ultra access cutaway. Floyd Rose 1500 tremolo system and Grover tuners. Volume/Tone/Intensity/3-Way pickup switch and 2-way on-off Sustainiac switch. 3-Way Sustainiac mode switch (Fundamental-Mix-Harmonic). These controls give the player an almost infinite selection of available tones. Strat style body with unique striping of the through neck. Flamed maple top contrasts nicely with the neck and ebony fretboard. (*) The short version is that this revolutionary design increases sustain many fold, allowing the guitarist to “morph" the sustained string vibration into cool-sounding harmonics during a solo or to throw the guitar into an infinite feedback loop. When it comes to buying a guitar, it’s very much a personal decision that is up to the musician to decide. Any one of these guitars would make a great addition to any collection. I have decided to pick one from each category that, based on the features that I would consider to stand out as the better of the four featured. In the “Under $300” category, it’s hard to go wrong with the ESP LTD F-50. It scored better than average in all categories, and if you can get used to its unconventional shape, this is a top quality instrument at a very reasonable price. In the “$300 - $600” range the choice was extremely tough. There wasn’t much separating any of the competitors. 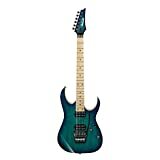 The Ibanez RG 7421 edges out its competitors due to its 7-string design, and wide variety of pickup configurations. This eliminates the need to carry multiple guitars to dial into the necessary tone for a particular song. In the “$600 - $1000” category, again it was a matter of choosing between several excellent guitars. In the end, it came down to the two Schecter guitars with the Hellraiser C-1 FR coming out on top by virtue of its EMG active pickups. When it comes to metal music, it’s hard to argue against active pickups. Just don’t forget to change the battery regularly. 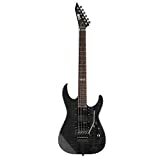 Finally, “Over $1000” range, the Schecter Banshee Elite-7 FR Sustainiac came out on top. It’s hard to argue with the tonal advantages of the Sustainiac paired with the 7 string design. I hope you found this article fun and informative. Keep on rocking! Don't forget to share with your metalhead fellows. Pingback: Metallica's Amps Settings: The Ultimate Guide for Die-hard Fans !